The worst question, by far, is, “What do you do for fun?” You can rack your brain looking for answers that make you sound cool (Fire-eating? Sword swallowing? Homemade stick and poke tattoos? ), or you can own it. The internet is rightly celebrating Jeopardy! contestant Margaret Miles for doing the latter. Miles is a librarian from Wilmington, North Carolina. 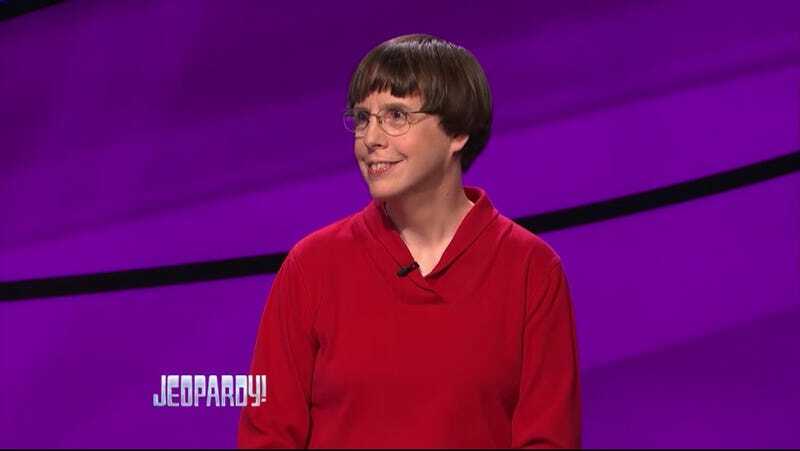 On Thursday night, she was leading mid-show with $7,600 when Alex Trebek paused to ask about her hobbies. “What do you do for fun?” he asked. Miles paused. “What do I do for fun?” She smiled. She made the internal calculation we all have to consider at moments like these, and then she became a legend. Miles followed up her legendary comments by winning the game, leaving with a little over $40,000; she’ll return Friday night. Reached for comment by the Huffington Post, Miles was as nonplussed as you might expect of a normal person suddenly touching viral fame. Understandably. Not that you need us to tell you this, Margaret, but in times like these, it’s really best to go and pet some cats.